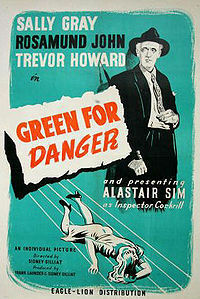 Green for Danger is a 1946 thriller film, based on the popular 1944 detective novel by Christianna Brand. The book Green for Danger was praised for its clever plot, interesting characters, and wartime hospital setting. The film version, starring Alastair Sim and Trevor Howard, with Sally Gray and Rosamund John, was directed by Sidney Gilliat. The film was shot at Pinewood Studios in England.